When Prince came to London a few years ago, he played more than 20 nights at the vast O2 arena. This time, he played a suburban living room to a dozen people. The enigmatic star flew into London yesterday at the start of a still-evolving string of dates in support of forthcoming album Plectrum Electrum, recorded with all-female trio 3RDEYEGIRL. Details remain scarce, but Prince said he hoped to play "iconic" venues along the lines of music club the Bag o' Nails - where Jimi Hendrix once played - famous rock venue Electric Ballroom and Ronnie Scott's jazz club. "We'll work our way up, if people like us, to bigger venues," Prince said. His first stop was the East London home of British soul singer Lianne La Havas, who met Prince last year while she was touring the United States. In her cozy living room in front of a crackling fire, the band played two acoustic tracks of what Prince called their "funky rock 'n' roll," including the newly released single PretzelBodyLogic. The tracks on the new album were developed during epic jam sessions at Prince's Paisley Park studios near Minneapolis. "We've been together for over a year and it's perfect," said Prince, who sipped a mug of strong tea with honey as he chatted to La Havas, her housemates and three journalists. "The more we play, the more fun it is, and addictive it is." Drummer Hannah Ford said the band sometimes jammed for 12 hours or more - interspersed with games of ping pong. "A lot of the time we didn't even know we were recording for an album," she said. "We were just jamming and vibing off one another." Prince said he hoped to record the band live during their stay in London, as well as buying "some clothes - and some tea". Blue have announced plans to publish a tell-all biography. Tinie Tempah has launched his own rap app that performs along to any of his songs. Prince may be causing a stir among fans keen to attend his intimate gigs but his comeback single is failing to do the same - and could fail to make the top 100. Kesha has vowed to come back "stronger" as she postponed her US tour to continue her rehab stint. Red Hot Chili Peppers have revealed that they were aware they would have to mime during their Super Bowl performance. Adam Rickitt has revealed he didn't enjoy one minute of his musical career. Little Mix are the toast of the US, after their second album Salute topped the American iTunes charts within a day of its release. 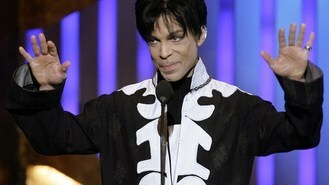 US singer Prince has taken to the stage of a small north London venue for a secret gig. US star Beck and Mercury Prize nominees Foals have been added as headliners for this summer's Bestival.